The children I’d followed up the narrow flight of stairs were happy to see me, mostly because the only time they were allowed on their roof was in the presence of a foreigner: neither IDF soldiers nor nearby settlers would dare harass the children in front of one. As my friend R. yelled at the children in Arabic to stay away from the edges (one need not speak the language to understand her anxious pleas), I looked around. To the north, five meters away, I could see through metal-reinforced windows into settler housing. To the east, maybe 50 meters away, what looked like a settler community center. To the south, a settler doing her laundry—a rare sight, according to R., whom my close friend H. had introduced me to earlier that day. IDF soldiers stood scattered along the rooftops in nearly every direction. 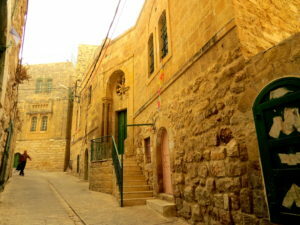 This was the Old City of Hebron in the West Bank. I’d been in Palestine for maybe 30 minutes. In the winter of 2018, I travelled to Israel and Palestine for the better part of two weeks. I went primarily to visit H., who’s from Hebron. Given where we both were at that time in our lives, I didn’t know when I’d next have a chance to see her. I found a cheap flight from the Balkans, where I had spent five weeks backpacking, and told her with little notice that I’d be coming to visit. I flew into Tel Aviv and went immediately to Jerusalem. Because I’d lost my only debit card in Macedonia, I was hesitant to spend the little cash I had, so I was attentive to price differences in Jerusalem. Wander around the western part of the city and you’ll find that a falafel sandwich costs somewhere between 15 and 20 shekels, or roughly $4.50–$6. Walk 10 minutes towards East Jerusalem, even less from the Damascus Gate entrance into the Old City, and you’ll find the same falafel sandwich for 5–8 shekels ($1.25–$2). Economics would argue that this is an unsustainable arrangement and that the more expensive falafel shops must either adapt to the market or flounder. Jerusalem, however, is far from the site of perfect competition that microeconomics envisions. Jerusalem feels like an agglomeration of scattered city-states or cooperating islands with imposed cultural and economic obligations to one another. Israel-Palestine at large functions in the same way. Folks in West Jerusalem don’t go to East Jerusalem—they think it’s too dangerous. For the same reason, folks from Tel Aviv don’t go to Jerusalem. Folks from Jerusalem think folks from Tel Aviv live in a bubble. Folks from Ramallah think Hebron is too dangerous. Folks from Hebron think Ramallans are too invested in their own worldliness, too detached from their roots. The West Bank feels especially like an island—property developers cannot build outwards, so every square meter of land costs a fortune. Jerusalem is similarly expensive, though for religious rather than spatial reasons. Unsurprisingly, land considered holy is extremely expensive. The challenges that living on holy land inevitably provoke are by no means felt uniformly throughout the area—it’s possible to live elsewhere in Israel and to feel little of the daily consequences of the conflict. This felt like the case in Tel Aviv. The day before I left the city and Israel for good, I saw some commissioned street art in front of a shop that read: “being free is a state of mind.” The irony of this statement is apparently lost on the citizens of Tel Aviv. This is what the internal fragmentation of the occupation allows for—except for the occasional 18-year-old with an assault rifle (they are far less prevalent in Tel Aviv than in Jerusalem) and an extended airport wait, liberal, forward-thinking folks in Tel Aviv generally don’t feel the daily ramifications of the conflict, despite the fact that the West Bank is around 50 km away at its shortest distance. One can be a professed progressive and condemn Netanyahu but admire this graffiti without having to confront its inherent absurdity. Tel Aviv is a trendy, vibrant place full of interesting modernist architecture. It’s likely the world capital of vegetarianism and plant-based eating more broadly. I felt more comfortable there than I did in Hebron and Jerusalem. Its vibe is closer to the sort of nondescript secular cosmopolitanism that someone from a big city in the West easily settles into. I had not anticipated how much trouble I’d have simultaneously keeping in my mind 1) that Tel Aviv would be a pleasant place to live, and 2) that this shouldn’t change how I feel about the political situation. One can find certain parts of Palestinian culture disagreeable and certain parts of Israeli culture appealing, but still recognize how completely unjustifiable the political situation is. One can criticize Palestine’s record on LGBT rights and affirm that Hamas is indeed a dangerous, fundamentalist organization, but still recognize the fact that Palestinians live under a brutal occupation. This is an easy idea in principle, but one that seems to have remarkably little staying power: like trying to recall an unremarkable phone number, it needs to be constantly, actively recalled to have any chance at permanence. Jerusalem is obviously considerably less secular than Tel Aviv, though the divide between religious and nonreligious life is more permeable than I’d assumed it would be. In the Old City of Jerusalem, land in the Muslim quarter is often bought by rich, secular Jews in Western countries and then given to Orthodox families who, despite living in astronomically expensive housing, still remain relatively poor. I was surprised to learn, too, that Haredi Jews’ Biblical studies are often funded by grants by foundations from these same western Jews. The lives of these Haredi Jews, at least superficially, resemble those of perpetual PhD students—always in the library, always without spending money. Of course, I am wary of vaguely alluding to a category of rich western Jews—often, discussion of such a class verges on anti-Semitic talk of a cosmopolitan cabal. My point is not that any such nefarious force exists, but rather that, in specific instances, secular and religious (often Orthodox) Judaism intersect in surprising ways. As I made my way through the region, I found myself repeatedly returning to the tenuous links between religious orthodoxy and Western secularism—much like the “second-generation” problem in western religious radicalism, it makes sense that many of the hardliner settlers in the West Bank are from western countries like the United States and France. Likewise, many of the Jewish tourists I spoke with seemed more resolute in their views than did young Israelis. The same was true on the Palestinian side—in the words of O., a friend I stayed with: “Many of the travellers that come here…seem more Palestinian than me!” A conversation I overheard between a volunteer at my hostel in Jerusalem and a young white South African girl is permanently etched in my brain. Having just gone to Hebron the day before, she waxed about how gorgeous it was, and repeatedly mentioned that she could “see herself living there.” When the volunteer said, “Isn’t it sort of dangerous?”, the South African girl seemed nonplussed. She explained that she was from South Africa and that the sort of segregation in Hebron was trivial in comparison. She seemed almost defiantly proud that she was on the wrong side of history. It took me a second to figure out where she had gone, as she had initially mentioned going to “Judea and Samaria,” not “Hebron.” In Israel and Palestine, names matter. Israelis will ask you where you’ve been in Israel, and then ask if you’ve been to Jerusalem yet. Palestinians will ask the same question, and after you say Ramallah, Bethlehem, etc., they’ll ask you if you’ve been to Jerusalem. Mention the Palestinians to Israelis, and in their response they’ll call them “Arabs.” In the 70s, it was official Israeli policy to refer to Palestinians as “so-called Palestinians.” Mention to an Israeli that you’re going to or that you’ve been to the West Bank, and they’ll say, “Ah, Judea and Samaria.” Foreigners in the West Bank nervously stumble over their words when speaking each other: “So, how long have you been in Palestine, and Israel…or, I mean the area?” Deciding whether to tag your Instagram post as being in Hebron, West Bank, or Hebron, Israel, is in itself a political exercise; the latter yields posts from IDF soldiers, settlers, and Israeli or Jewish tourists. The majority of Israeli citizens I spoke with, even those openly hostile to Palestinians, were critical of the settlers. After listening to so many Israeli citizens calling the settlers hardliners or fundamentalists, I wondered: how can a land-populating system so blatantly illegal under international law and the Geneva Conventions continually receive funding, support, and military protection by the Israeli government with seemingly mixed public support? Two days before I landed in Tel Aviv, the Israeli government approved the construction of over 1,100 new settlement units in the West Bank. Choosing to defend already-existing Jewish settlers is one thing—the Israeli government feels an obligation towards its people—but the continued approval and construction of new settlements, from an outsider’s perspective, seems to be not only a “major obstacle” towards a two-state solution, as UN Secretary-General António Guterres says, but a nearly impassable one. I don’t mean to imply that the two populations can’t live together—in Tel Aviv, Haifa, and even Jerusalem, 99.99% of the time, Jews and Muslims do coexist—but in situations like Hebron, where there are daily, painful reminders that the 1967 borders are being perpetually ignored, these settlements and lasting peace seem mutually exclusive. This is not to say that Jews don’t have historical claims to the land, or that Palestinians have not been historically guilty of atrocity, but to emphasize that the settlers prefer to evoke anachronistic religious or historical rather than legal claims to the land. The further R. and I went into the Old City of Hebron, the more the streets cleared out. It was not quite dusk. I looked through a fence and saw a settler sitting in his car taking a video of me. I’d been told that he was a known instigator and better avoided altogether. There are upwards of 340,000 Israeli settlers in the West Bank today, and another 200,000 in East Jerusalem. The largest settlement just outside of Hebron is called Kirya Arbat, and it houses around 7,000 settlers. It is possible to imagine lasting peace agreements with settlements like Kirya Arbat, as they’re relatively removed from the cities themselves. I had started this bout of traveling in Cyprus, whose capital, Nicosia, has been divided more or less on a straight line since 1974, and since 2003, both sides have been able to freely cross the borders. This is not to compare two completely dissimilar situations, or to imply that this kind of freedom of movement is a possibility (or even in a good idea) in the West Bank, but to stress that topography matters. The settlements within Hebron’s Old City, with a population of around 700, are hopelessly entangled within the heart of the city. Shuhada Street, once a vital economic and cultural thoroughfare, now acts as a buffer zone between the settlements and the rest of the city. Wandering is impossible in the Old City—every other right turn seems to lead to a fortification or barrier separating the settlements from the city itself. As R. and I continued walking, I began to learn what life is like in Palestine for outward-looking young people. Young Palestinians deal with the occupation in different ways: some forge their own quasi city-states in their apartments and travel through the foreigners who come to visit. Others live on the internet, feeling more at home amidst friends from far-off places than in the daily lived experience of the West Bank. Many Arab-Israelis I met feel perpetually in limbo, stuck between trying to get on with their daily lives and figuring out their position within the larger conflict. Regardless of their approach, many of the young people I met feel torn between going abroad in search of a better life and attempting to be a part of the next Palestinian generation. Going abroad for any substantive period of time is beyond difficult. Palestinians need visas for a majority of countries, including most of the Gulf States. Many, many of them study abroad: the friend I came to visit completed graduate school in the U.K.; her father, at Johns Hopkins; a doctor I visited for a routine physical, somewhere in D.C.; a grocery store owner, at Southern Illinois State University. Being a student, however, is different from traveling. Even though H. received a scholarship, so an institution paid for her international tuition fees and living expenses, upon trying to return to the U.K. as a tourist, her visa was denied. Her experience is not unique; in H.’s city, 22 of 24 Palestinian citizens were denied tourist visas to the U.K. during the month that she applied. If they are lucky enough to get visas, being able to afford international travel is another matter. Because Palestinians are disallowed from using the Ben Gurion airport in Tel Aviv, they are obligated to travel via Amman Queen Alia airport, which is, conservatively, three to four times more expensive, given that budget airlines don’t travel through the airport because taxes are very high. To reach the airport, Palestinians first have to cross the Allenby Bridge, which is very expensive and can add indeterminate delays to travel itineraries. It is often only wealthy Palestinians, then, who have the chance to travel, which further solidifies the cultural divide between places like Ramallah and places like Hebron. On a day trip to Bethlehem, easily the most visited part of Palestine, I spent a few hours looking at the Israel West Bank Barrier, colloquially called The Wall. It is most known for being the site of multiple Banksy works, as well as dozens upon dozens of Banksy imitations, genuine street art, and pedestrian graffiti of the “David Wuz Here” variety. On The Wall, there are multiple drawings of the likes of Trump and Netanyahu, political cartoons about Israel’s repeated defiance in the face of the Geneva Conventions, as well as more ambiguous pieces, like a Nelson Mandela quote next to a giant picture of Morgan Freeman, and a similar (but more comical) picture and quote by Larry David attributed to Bernie Sanders. Not long ago, Chicago rapper Vic Mensa published an article about the parallels between the Palestinian question and racism in America. It’s not a perfect comparison, but after reading stories on “The Wall Museum” about young Palestinians forced to give up on their dreams for one reason or another, it’s hard to not recall Langston Hughes’ “Harlem”: What happens to a dream deferred? Further along The Wall (if such a wall can said to have a start and stopping point), I came across a piece of graffiti that I assumed was written by an American: Sorry My Tax Dollars Paid For This. This is not uncommon among leftist Americans abroad; criticizing the US from a distance is comfortable territory, and it fits well within the long-standing American tradition of American citizens gradually making the conversation about themselves. But it’s difficult, if not impossible, to ignore how essential the US has been in supporting Israel both economically and militarily. I think of the words of Edward Said, spoken just four months before his death: “It seems clear that Israel could not be doing what it’s doing now […] were it not for the unconditional support of the United States.” Said passed away in 2003, but not much has changed regarding the US’s involvement in the conflict—when the UN called for an independent investigation into the recent Palestinian deaths at the Gaza Strip border, the US swiftly blocked the resolution. At the time of this writing, there are 18 reported Palestinian deaths and approximately 1,400 injuries. There have been no reported IDF injuries. Likewise, the US has only continued to bolster its financial support for Israel. Last year was my first year out of graduate school, and as a result, the first year I’d made enough to have to pay taxes. The US currently gives Israel $3.1 billion annually in aid. Starting in 2019, that number will increase to $3.8 billion and will also include a myriad of military-related equipment. Standing in front of The Wall, I can’t help but think: how much of my tax money is directly responsible for the myriad machine guns I see in the hands of 18-year-olds? The cost of a West Jerusalem falafel sandwich? Fifty falafel sandwiches? Upon visiting the Ibrahami Mosque in Hebron, which is holy to both Muslims and Jews and thus a major source of conflict in Hebron, R. was stopped and pointlessly harassed by guards while I was waved ahead. As I’ve worked on this piece, H. has been looking for a flight to one of the few nearby Muslim-majority countries she can easily get a visa for—I could fly to the same country from London for far less. Being committed to Jewish identity and the flourishing of Israel is not mutually exclusive with supporting the Palestinian claim to statehood. The Israelis I admired most were prime examples of this: those who would risk legal trouble by meeting with West Bank residents while trying to observe Shabbat at the same time. What seems incompatible is a stated support of a two-state solution coupled with financial, military, and infrastructural support for settlements in Palestinian territory. What was once a two-minute walk for R. to visit her grandfather’s grave in Hebron is now a 40-minute journey around the city. It feels disingenuous to point towards what is essentially a series of middling inconveniences when extrajudicial, physical violence is not at all uncommon, but, to borrow a Catholic idea, to be under occupation means perpetual purgatory. These sort of legal and extra-legal petty conveniences begin to make a life—routine is impossible because predictability is impossible. This, from my brief point of view, is what the occupation looks like. Where physical violence is absent, symbolic violence takes its place. Jeremy Klemin is currently on a Fulbright grant in Curitiba, Brazil. You can find other work of his in The Millions, The Stockholm Review of Literature, and 3:AM Magazine. He studied comparative literature at the University of Edinburgh, and can be found on Twitter @JeremyKlemin.